Looth a tooth? 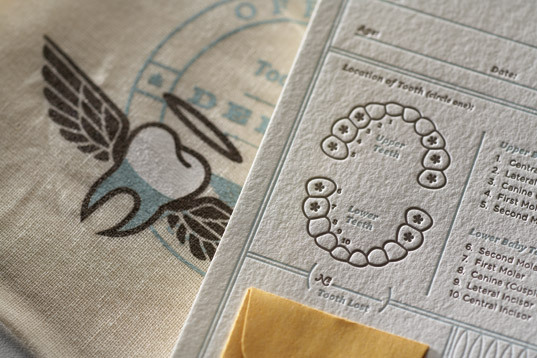 Help your tyke keep track of every wee molar, canine, and incisor with the Official Tooth Fairy Kit, which contains a letterpress Certificate of Record made from recovered cotton fibers (to be filed with your local Tooth Fairy), along with an unbleached cotton deposit bag for all of your transactions. To get the fallen tooth processed, simply tuck it inside the attached envelope, fill out the relevant fields on the certificate (age, tooth lost, method of extraction, compensation), then insert the certificate in the deposit bag and place the full bag under your child’s pillow. The Tooth Fairy will pick up the certificate and leave your cha-ching in the deposit bag by morning. Looth a tooth? Help your tyke keep track of every wee molar, canine, and incisor with the Official Tooth Fairy Kit, which contains a letterpress Certificate of Record made from recovered cotton fibers (to be filed with your local Tooth Fairy), along with an unbleached cotton deposit bag for all of your transactions. To get the fallen tooth processed, simply tuck it inside the attached envelope, fill out the relevant fields on the certificate (age, tooth lost, method of extraction, compensation), then insert the certificate in the deposit bag and place the full bag under your child's pillow. The Tooth Fairy will pick up the certificate and leave your cha-ching in the deposit bag by morning.